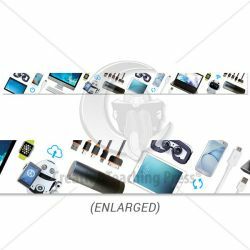 Go hi-tech with this 21st Century Technology Border that features a clean white background along with real photos of new technology devices including an iPad tablet, smartphone, smart watch, robot, lap top computer, desktop computer, USB charging cords, and more. The border also features tech symbols for the cloud, wi-fi, reload, and power. This border is perfect to trim any bulletin board in a science, math, engineering, media, or technology classroom. Perfect for STEM, STEAM and makerspace!